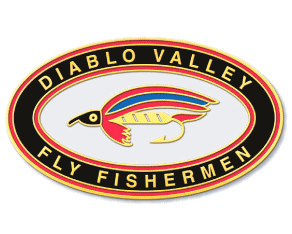 Welcome to the Diablo Valley Fly Fishermen club website. We are a group of men and women who share a common interest in the sport of fly fishing. The members of the DVFF help each other develop their skills and knowledge in the pursuit of this fascinating sport. The DVFF serves its members through club activities and resources including a novice seminar, a Youth Fly Fishing program, skills seminars, fishing outings, guest speakers at regular meetings, an online forum, a DVD lending library, Facebook page, and an annual auction. The club sponsors a scholarship for research in Fisheries Biology and/or Riparian or Limnetic Ecology by a student of the UC Davis College of Agriculture and Environmental Sciences, Center of Aquatic Biology and Aquaculture. The DVFF also supports a large Trout In the Classroom program and sponsors the local Project Healing Waters Fly Fishing-Martinez, CA program. Anyone interested in fly fishing is eligible and welcome to become a member of the DVFF. For a little insight into our club, watch The DVFF's 50th Anniversary video. Silent Auction 6 p.m. | Live Auction 8:30 p.m. This is one activity held each year that is a must for you. It is your chance to get some good deals and some great deals. 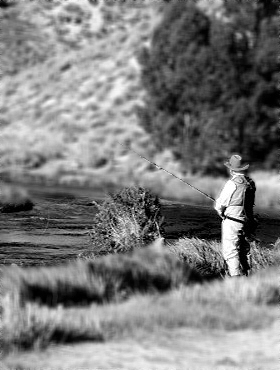 The DVFF Auction is your one chance each year to get great deals on all things fly fishing: new rods, reels, lines, member-tied flies, guided trips, boots, waders, books, accessories and more. These items will be spread across a raffle as well as silent and live auctions. This is the DVFF’s main fundraiser supporting its donations to conservation groups* protecting and improving waters we fish, a fisheries-related scholarship at UC Davis’s Center of Aquatic Biology and Aquaculture, and other fly fishing programs. We start at 6 p.m. with a silent auction of some of the best flies in Northern California, simply because many of the best tiers are DVFF members. Dozens of flies will be on display for your review and bidding until 7:45 p.m.
Everything for the live auction will be on display from 6 p.m. to 8 p.m., plenty of time to mark your favorites and set your wish list prices. The live auction starts at 8:30 p.m.
You can join online or join the DVFF online or download a membership application. (The membership form requires Adobe Acrobat Reader.) Print out and complete the form and either bring it to a meeting or send it to the club mailbox (Diablo Valley Fly Fishermen, P.O. Box 4988, Walnut Creek, CA 94596). You may also pick up an application at a meeting. 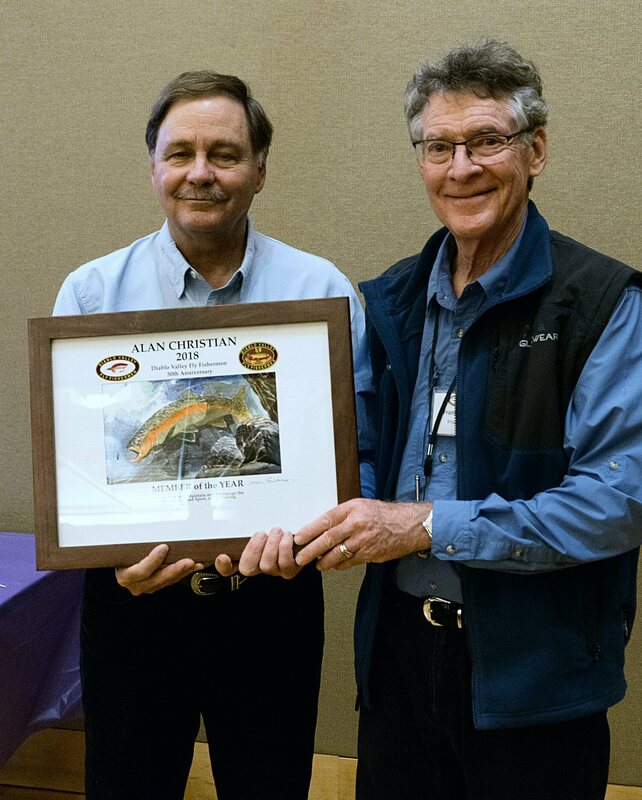 Congratulations to Alan Christian, the 2018 Member of the Year! The DVFF offers fly fishing classes during the spring and fall. Check the Novice Fly Fishing Fundamentals page for additional information. Our fly tying course can introduce you to some of the most commonly used patterns. You should check the Fly Tying Class page and Windknots for updated information and schedules. In our rod building classes experienced members will guide you through the creation of your custom fly rod. Classes are announced in our Windknots newsletter and are usually held on Saturdays.